A touching story of friendship, compassion, and a look into the complex and intense nature of caregiving. 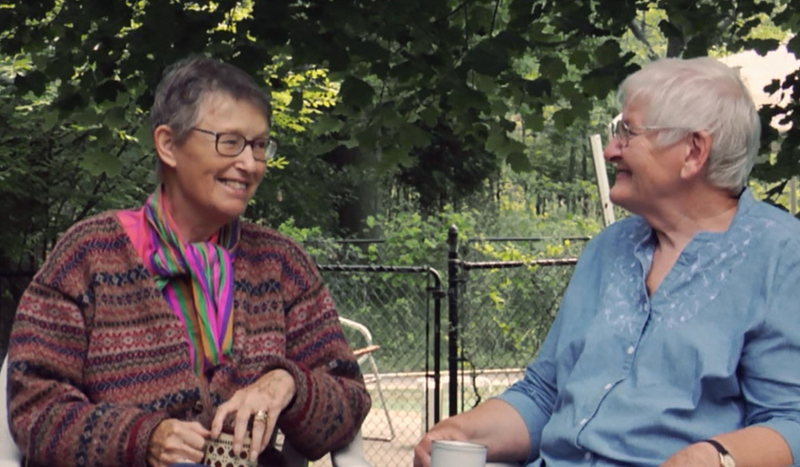 What resonates most in this documentary is the true depth of the friendship between Sybil and her lifelong friend Betts, an Alzheimer’s patient. Her patience seems natural, even though she alludes to it being a skill that Betts had taught her over the course of their friendship. Her comprehension of the disease is neither overly clinical or overly simplified, but rather what you might call a working understanding of what the disease means to and how it affects Betts. Her positivity in the face of losing what you come to understand is less than a friend and more of a true sister, is not only inspiring but humbling. Throughut the film, there is no sense from Sybil, or Betts’ family members, of martyrdom. There is no evidence of a mentality that can often, and rightfully so, be found in documentaries about illness, of suffering. They describe the diagnosis and its effect on Betts and her life as a journey, rather than a death sentence. This is best illustrated, quite literally, through Betts’ art. Sybil, a seasoned artist and teacher, exclaims repeatedly through the film that she is enchanted by the way Betts’ art developed as her disease did. She was taken by her new use of colour and expression, which only helped Sybil to truly see that Betts was still Betts, still a whole person, whose journey changed in the light of this complicated and difficult disease. Sybil notes, humbly and beautifully, that she is merely returning the kindness and the love that Betts had shown her for the 50+ years of their friendship, something that comes across authentically and honestly not only throughout the entire film, but also during the Q&A after the screening. The director also does a wonderful job of capturing this, without feeling like there is an angle or a hook he’s trying to hone in on other than the lovely and generous spirit of Sybil and Betts’ friendship. One of the most charming moments of the film is while Sybil, Betts and her caregiving Mary are getting ready for the Walk for Memories event. They chose their outfits, donning leather vests and other biker apparel (winning best costume no less!) and Sybil explains to Betts why they are there. She does not say that they are there merely because of Betts’ diagnosis, but that they are there to raise money and awareness for other patients less fortunate then them. Less fortunate in that some patients do not have the support system and caregiving access that Betts does. This moment is touching and really, truly shows the humbleness of these two women that even in the face of a diagnosis they are able to put their experience, as difficult as it may be into perspective. To say the film itself is inspiring almost doesn’t seem to do it justice, because it was inspiring in so many different ways; in friendship, in caregiving, in Alzheimer’s awareness, and even in demonstrating the journey in the life of a patient. A must-see for all of those affected by Alzheimer’s, and even more so for those who are not. It is through these human experiences captured in reality and in the spirit of hope and patience that allows us to see beyond the diagnosis and embark on the journey it brings.